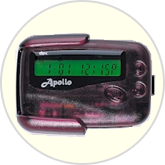 Classic side-read numeric pager with large easy-to-read backlit display. Includes slide-in holster with spring-loaded belt clip. Available in several color choices. Size: 2.37" x 1.56" x .63"